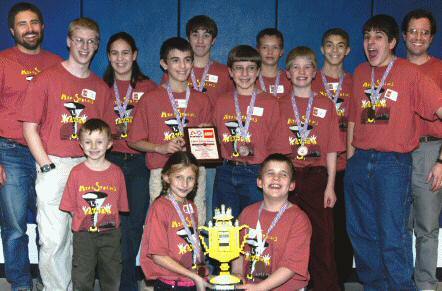 For the 2003 season, one of our team members "graduated" and became the team's Young Adult mentor. We also added three new members. Once the new challenge, "Mission Mars," was announced, we started building and programming our robot, and researching for our research presentation. After three months of hard work we qualified for the New Hampshire State Tournament and entered the competition on the thirteenth of December. After finishing third in the robot competition table our team won the Director's Award which qualified us to compete in the FLL Invitational Tournament to be held in Atlanta, Georgia at the Georgia Dome in April 2004! We arrived a day early at Atlanta and our team settled in at our hotel. The next day, the competition began bright and early in the morning, starting with our being judged for our research presentation, technical understanding, and teamwork. We were also able to run our robot in a practice round on the official competition tables. After a hard day of work the FLL tournament hosted a celebration at the Sci-Trek museum. After eating breakfast the next day, the team members representing Mindstorms Mayhem lined up for the robot parade. Immediately after the parade it was straight to the pits for our first robot round. We were called back for our research presentation and it went better than ever before! We scrambled back to the pits and almost missed our second table round. Later, the special assignment was announced. We were to be part of a Four Team Alliance! After our last table round we toured Atlanta for a while and then went to a party at a friend of the Schunemanns. After another late night we scrambled back to our hotel and anxiously dove into bed, ready for the awards ceremony the next day. On the last and final day of the FLL Global Tournament we hiked down to the Georgia Dome filled with energy. We piled into a row at the dome and anticipated the awards. Along with partner teams from Alaska, North Carolina, and Mississippi, we won the Special Alliance Assignment! Soon, the only award left was the coveted Director's Award. We were hanging on the edge of our seats when the emcee called out, much to our amazement and joy, the name of our team - Mindstorms Mayhem! 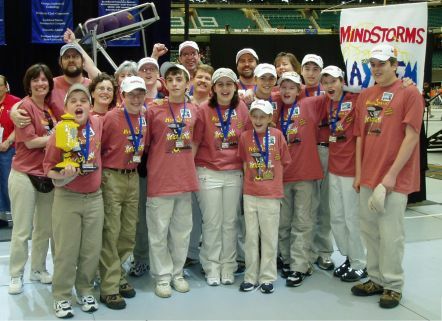 Our team, coaches, and family members after winning the Director's Award at the 2004 International Competition in Atlanta, Georgia.